The Standard & Poor’s 500 Index is up 58% from its March lows, gold has finally broken through the $1,000-an-ounce level – and may go higher – and bond yields have fallen substantially in spite of the huge U.S. budget deficit. It’s really not difficult to tell when you’re in a bubble. What’s tough is trying to figure out how to invest while it’s developing. When current Fed Chairman Ben S. Bernanke doubled the monetary base in a few weeks last fall, it was pretty obvious that the extra money would appear somewhere, either as zooming asset prices or as surging inflation. After all, the rapid increases in the U.S. money supply after 1995 produced a stock-market bubble and then a housing bubble. And don’t forget about interest rates. When oil prices doubled in less than 12 months between 2007 and 2008, it was because Bernanke aggressively cut interest rates after the recession first hit in late 2007. So you’d have to believe that money supply was irrelevant not to expect markets to start behaving oddly at some point. That’s why – since late in 2007– I have been recommending investments in gold and other hard assets. While the recession had sharply reduced demand for oil, causing its price to drop from its record high of $147 a barrel in July 2008 to around $30 in February, the gold price had dropped only from its March 2008 peak of $1,000 to around $700, before rebounding. Gold prices remain far below the inflation-adjusted equivalent of their 1980 peak, which would be around $2,300 per ounce today. Likewise, silver prices are even further below their 1980 peak, which would be around $130 per pounce, or nearly 10 times the current level. Since both gold and silver markets are relatively thin compared to the money available – annual gold production is only $100 billion at current prices – the potential for a run-up is considerable. The difference between a bubble and a sound bull market is that a bubble happens more quickly. Normal valuation metrics get ignored. You couldn’t rationally justify – on any sort of long-term basis – the dot-com stock prices of 1999, the California house prices of 2005, or the $147-per-barrel record oil prices of 2008. Similarly, today’s cost of extracting gold is nowhere near $1,000 an ounce. Mining costs have increased. But extraction costs are still only about $400 an ounce for top-tier miners. Likewise, with inflation at 2% and U.S. budget deficits at more than $1 trillion per annum, there’s no justification for a 10-year U.S. Treasury bond yield below 3.5%. Let’s look at stocks. And let’s say that the market of early 1995 – when the Dow Jones Industrial Average was at 4,000 – is a reasonable base for estimating a fair value for the U.S. stock market. If that were the case, then inflating the Dow in line with nominal gross domestic product to keep it at fair value would bring us to a current day estimate of 7,800. However 1995 wasn’t a bear market, and economic and earnings prospects that year were really good. Besides, the Internet was just starting its rise to prominence. Today, we’re in a deep recession, with huge budget deficits and high unemployment, yet the Dow is closing in on 10,000. In other words, U.S. stocks are overvalued. Even after the bearish trauma of last year, we remain in a stock-market bubble. 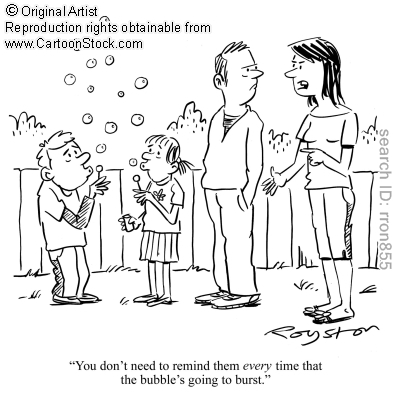 Bubble investing is different from bull-market investing. There aren’t many “good” values, so you have to be very careful. One bubble-market strategy is to just put everything in cash and hide under the bed. How boring! Plus, as your neighbors brag about their profits at cocktail parties, you’ll feel like an idiot until the bubble bursts. Remember, even after your neighbors’ profits have turned to losses and you look smart, you can never get those cocktail parties back! That doesn’t mean you should abandon prudence, however. You should certainly keep much higher cash reserves than normal. Indeed, consider investing a chunk of that cash in one of the non-dollar-denominated WorldCurrency Access Deposit Accounts offered by EverBank. At the same time, it’s a pity to completely miss out on the returns one can earn in a bubble environment. But you have to careful and smart. A second bubble-investing strategy is to find something that isn’t overvalued, and buy only that. That strategy worked great for me back in 1999. I was working in Croatia, which was going through a deep economic crisis. NATO was bombing neighboring countries in the Kosovo War. That played merry hell with tourism, Croatia’s main foreign currency earner. Croatian shares – there were about six at the time – were each selling at less than five times earnings. So I invested in Croatia and made out nicely when the war ended and things returned to normal. The problem with that approach is globalization. It was just possible in 1999 to find undervalued investments, if only by putting your money close to a war zone. It isn’t really possible now, at least not to any great extent. Three months ago, there were lots of shares even in the United States, which had been bombed out by the downturn and hadn’t recovered. There aren’t many left now; if a share is bombed out today there’s probably good reason for it. A third potential strategy is to try to time the bursting of the bubble. For example, you could buy the ProShares UltraShort Trust (NYSE: TBT), inversely related to twice the Lehman Brothers Holdings Inc. (OTC: LEHMQ) 20-year bond index. Then you’d wait for the bond market to crash, and TBT to soar. First, the ProShares UltraShort Trust has a fair-sized tracking error, because they have to rebalance the fund daily. Thus if you hold it too long, you won’t do as well as you should. Second, the bubble can take a long time to burst; meanwhile it goes on inflating and you get killed. In the long run, it was a good idea to short Cisco Systems Inc. (Nasdaq: CSCO) in 1999. In the short run, it wasn’t so clever. The normal investment approach, to buy only the most conservative companies in an overvalued but bubbly sector, also doesn’t work. Everybody else is looking for them, too. And that means they end up being overvalued. Besides, they will advance only modestly with the inflating bubble, so you won’t make enough to compensate for the risk of buying too high. The best alternative, therefore, is to buy bubbly investments – but the junk, not the cream. Buy gold and silver mines that even at $900 an ounce have only been running at close to break-even, because they have expensive deposits. Don’t buy political risk (i.e. mines in dodgy countries), because if the gold price goes up, the local dictator will seize your company’s winnings. But operating risk is okay. And high operating costs are fine. If your mine has operating costs of $800 an ounce, you’ll make out like a bandits if gold goes from $1,000 an ounce to $1,200. That way, you need only put a modest amount in the investment, and it will zoom up to several times what you paid, making as much profit as if you’d put your entire fortune in something conservative. Make sure to put only a portion of your money in such a play. Keep the rest in cash. Don’t be greedy – better to sell too early than too late. Better to leave the theater at the first wisp of smoke, than to wait until the entire crowd is panicking and heading for the exits. I hate bubbles. And I hate Bernanke and the other central bankers for causing them by their misguided monetary policies. But you can make money out of them. Just don’t get carried away.